Now that production is underway on Super Troopers 2, the cast for the long-awaited sequel is growing. The latest addition to the sequel for this cult comedy favorite comes in the form of Parks and Recreation star Rob Lowe. According to the report, Lowe will be playing a French Canadian named Guy Le Franc, a former hockey player and the current mayor of a Canadian border town near Quebec. The news of Rob Lowe's addition to Super Troopers 2 comes courtesy of Deadline, which was also confirmed by the Broken Lizard Twitter account. The report was accompanied by a photo that not only showed Rob Lowe on the set near Boston, but it also showed all of the original Super Troopers cast in uniform, which really helps to make this feel real, as we have been waiting a very long time for this movie to finally get rolling. Here is how the Broken Lizard gang welcomed Rob Lowe to the cast. "Meet Mayor Le Franc. 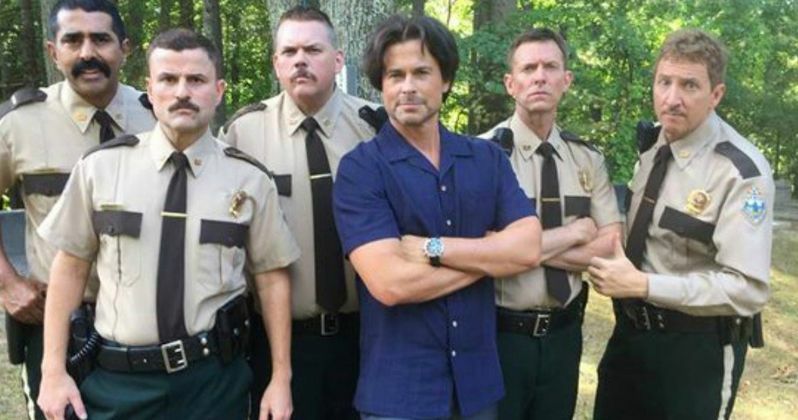 @RobLowe has joined #SuperTroopers2." More than a few movies have managed to get made through the aid of crowdfunding, but last year, Super Troopers 2 had an especially successful campaign. More than $4.5 million dollars was raised through an Indiegogo campaign to get the movie made, which was more than double what the Broken Lizard gang had hoped for. Rob Lowe joins a cast that features all of the original Broken Lizard regulars including Jay Chandrasekhar, Kevin Heffernan, Paul Soter, Steve Lemme and Erik Stolhanske. The $4.5 million that was raised should be more than enough for the guys to deliver a worthy sequel, considering the reported production budget for the original Super Troopers was only $3 million. That movie went on to make $23 million at the box office but found a much larger audience over the years. There is no word on a distribution strategy for Super Troopers 2 as of yet. It seems likely that once production is wrapped there will be some sort of bidding war from potential suitors, given the already very high level of excitement for the movie. Perhaps this is another thing that Netflix will scoop up, since they have been spending an awful lot of money lately to get big, exclusive movies. Jay Chandrasekhar is once again in the director's chair for Super Troopers 2, which has had a slightly confusing road to production. Some filming had started in October of last year, but then production was stopped and didn't resume until recently, with the team claiming that this new round of filming was "day 1." Either way, things are underway now and they are shaping up quite nicely. We will be sure to keep you up to date as more details on casting and a release date emerge for Super Troopers 2.